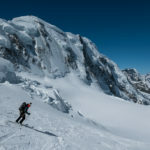 Ski touring around Monte Rosa massif. 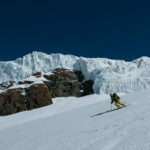 Punta Giordani, Capanna Margherita, Pollux. 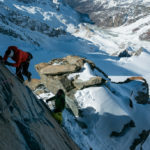 The Monte Rosa range is the biggest mountain massif in the Alps, there are 18 “official” peaks over 4000 meters, Punta Dufour with its 4637 meters is the second highest in the Alps. 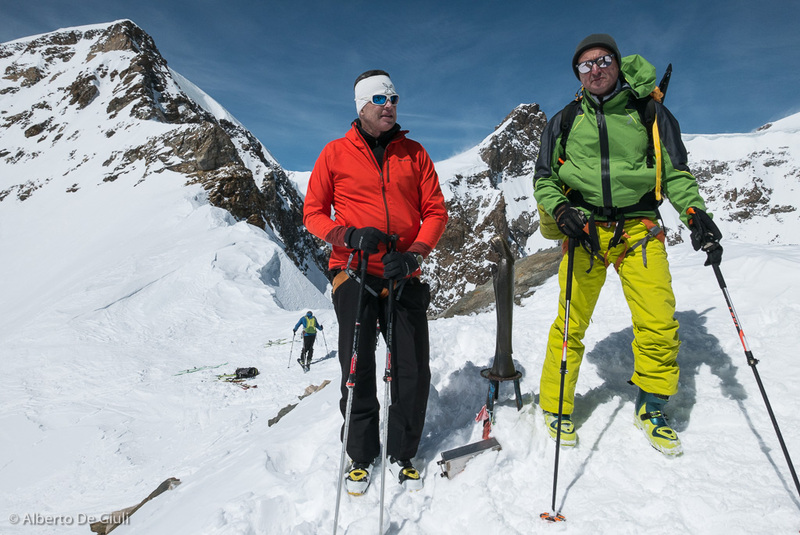 The access to the high altitude is quick and easy thanks to the ski lifts, when you start your journey from Zermatt, Cervinia or Gressoney. 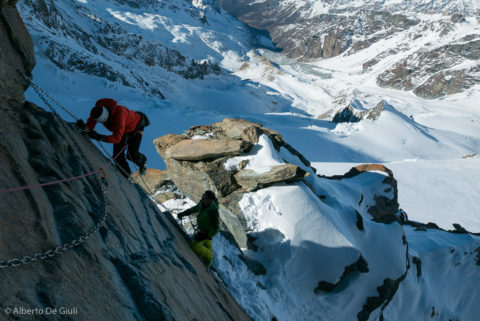 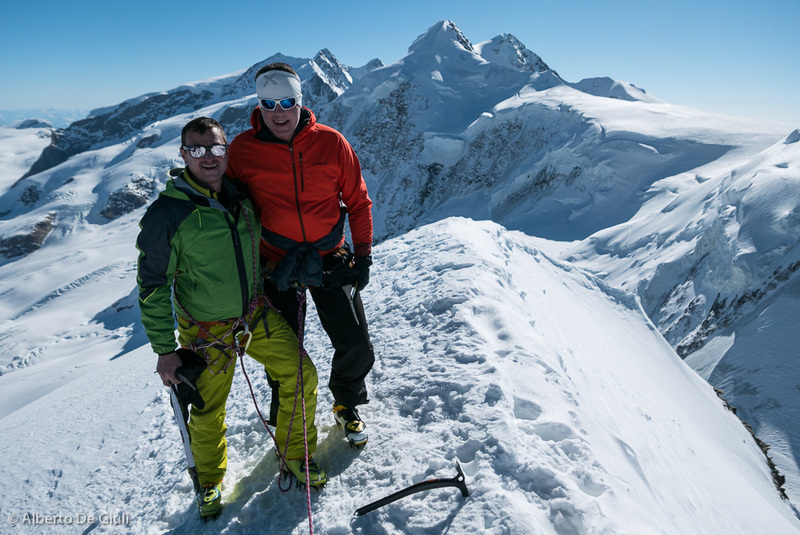 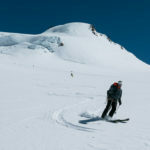 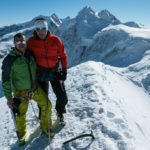 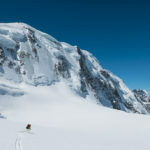 The Monte Rosa is a paradise for mountaineers who will to collect the 4o00 meter peaks of the Alps, and in the spring many of these summits are pretty accessible on skis. 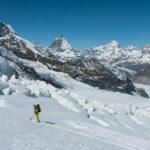 If you plan a multi day trip, there’s the chance to summit many of these peaks, spending the night in comfortable huts above Gressoney in the Italian side of Monte Rosa (Rifugio Mantova and Capanna Gnifetti), or you can make a ski traverse between Switzerland and Italy, or better a real loop, like the one I’m going to talk to you about. 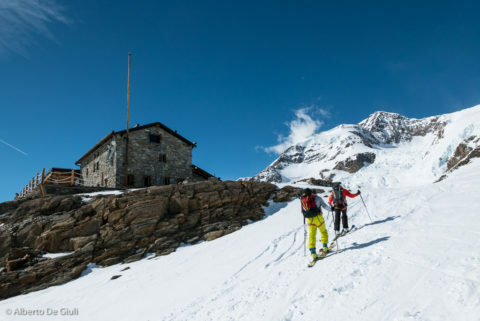 Punta Giordani, ski touring around Monte Rosa massif. 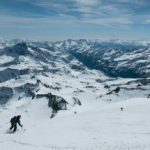 Planning a 3 day ski trip, starting from Gressoney lift station, on the first day you can already climb on top of Punta Giordani, the snow slope that leads to the top starts right outside the Indren cable car top station, and you can cover the 800 vertical meter climb in about 3-4 hours, depending on the training and especially the fatigue that you might feel if you’re not properly acclimated. 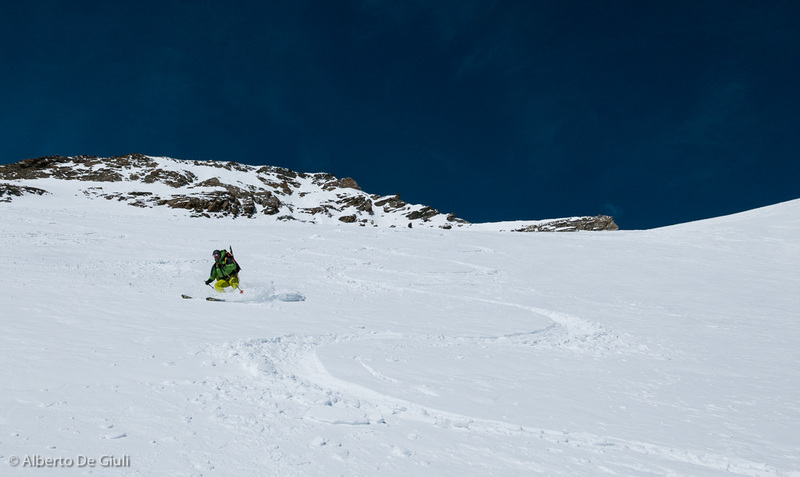 The downhill right from the top, with good snow conditions, guarantees excellent skiing on corn snow around noon, and you spend a good hour later in the afternoon to approach to Rifugio Mantova or Capanna Gnifetti, both pretty (Mantova is newer, smaller and more comfortable, the Gnifetti is a piece of mountaineering history, great atmosphere but if it’s crowded … it means that there might be even more than 150 people. 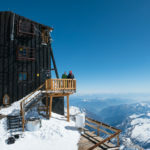 Yes, it can fit more than 170 people at 3600 meter!). 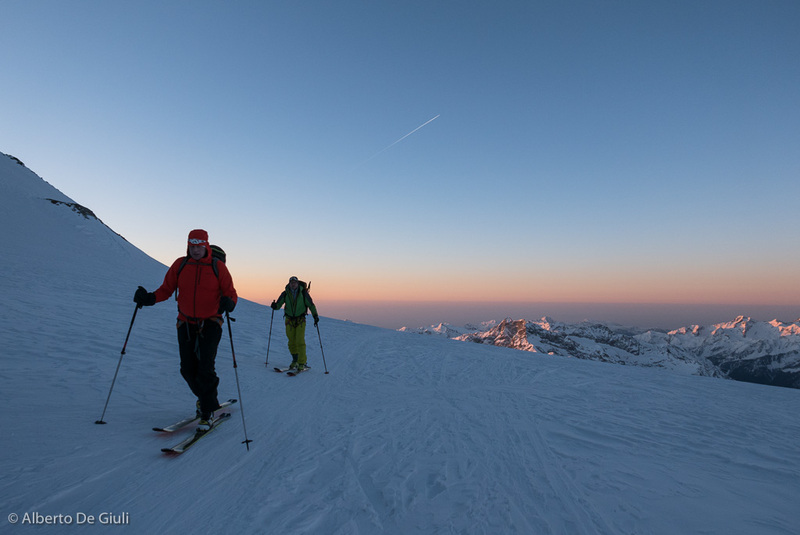 Skinning to Rifugio Mantova. 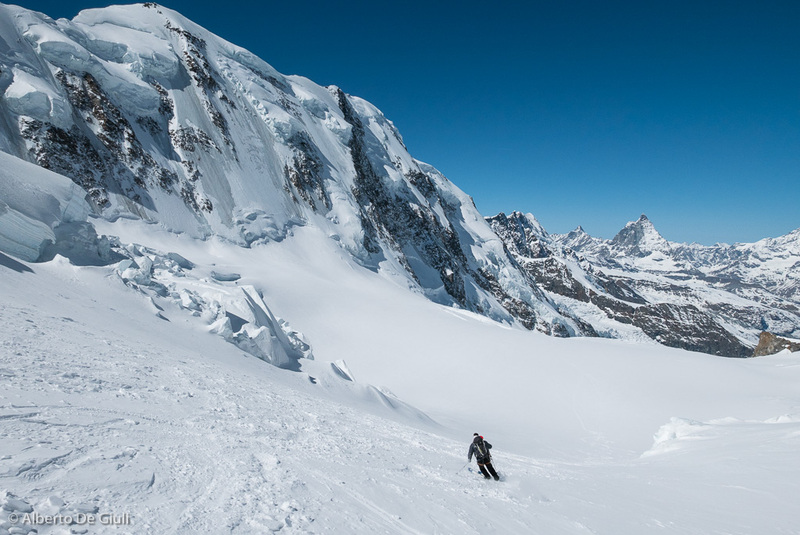 Ski touring around Monte Rosa massif. 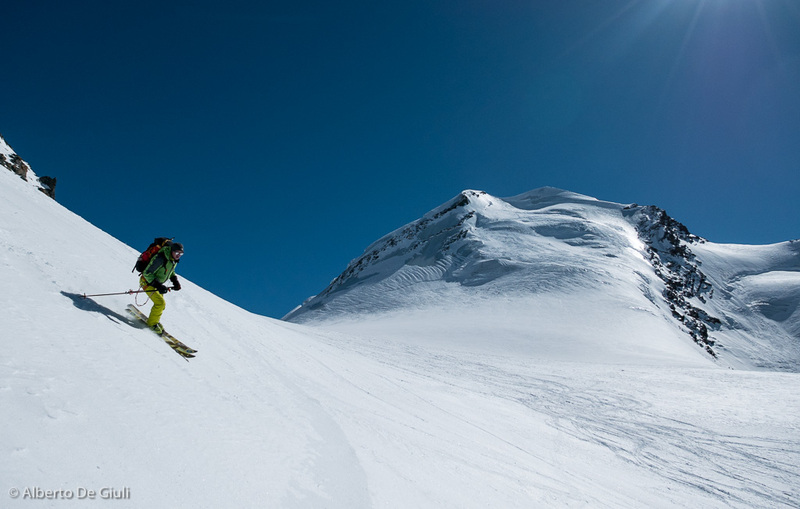 The following day, depending on your fitness, will and what time you plan to set off from the hut, you can bag several 4000 meters before getting on top of Signalkuppe and enjoy a superb view from the highest hut in the Alps, the Capanna Margherita. 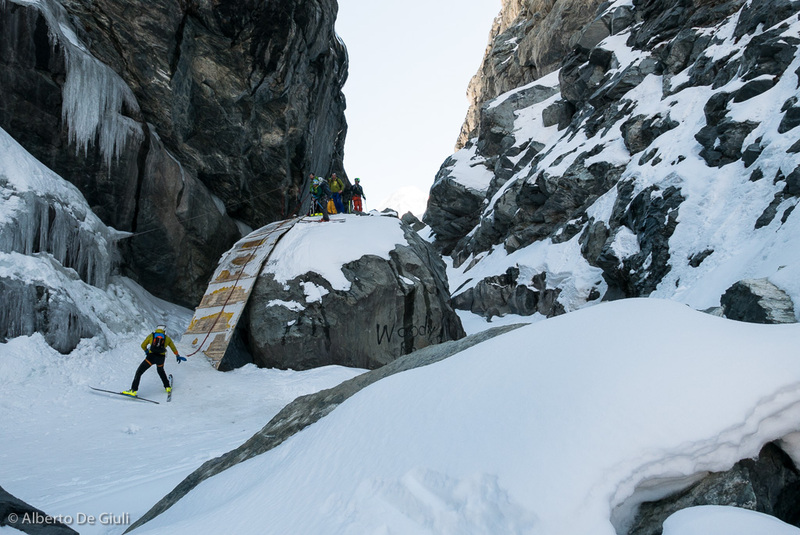 It ‘now time to buckle your boots up, take the skins off and start to enjoy the descent, and while the majority of the skiers will follow the route back to Colle del Lys, you turn right toget into one of the most impressive glaciers in the Alps, the Grenz . 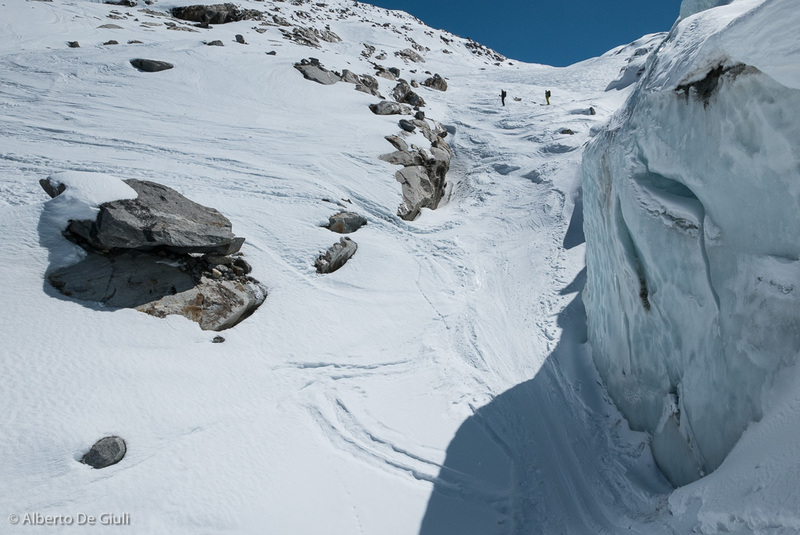 Crevasses, seracs, the impressive view of Lyskamm north face… this valley is very wild and phenomenal. 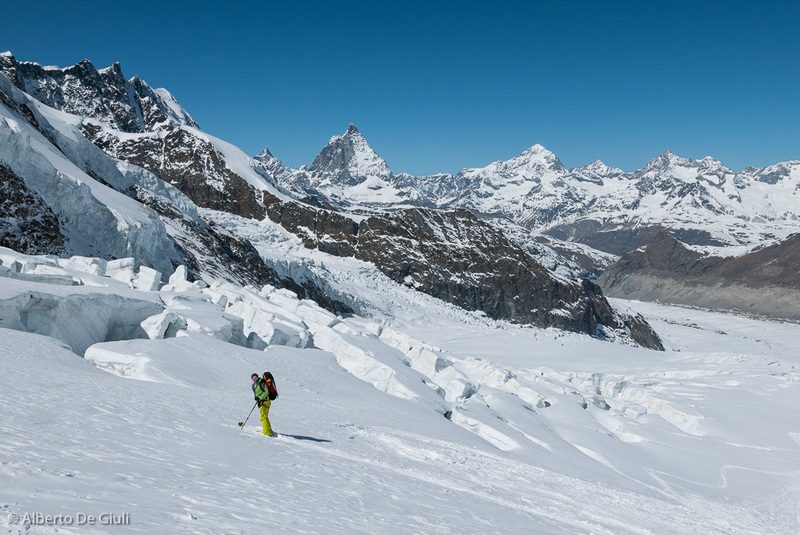 It’s a long adventure the descent down to Furi and Zermatt lifts , a unique experience not to be underestimate. 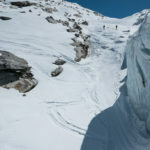 It’s important to plan this descent with good timing to avoid skiing across the glacier during the warm hours (the Grenz Glacier is full of crevasses…), as well as for the latter section down the gorge to Furi, where you ski all the time on a hard snow trail above the water flowing from the glacier . 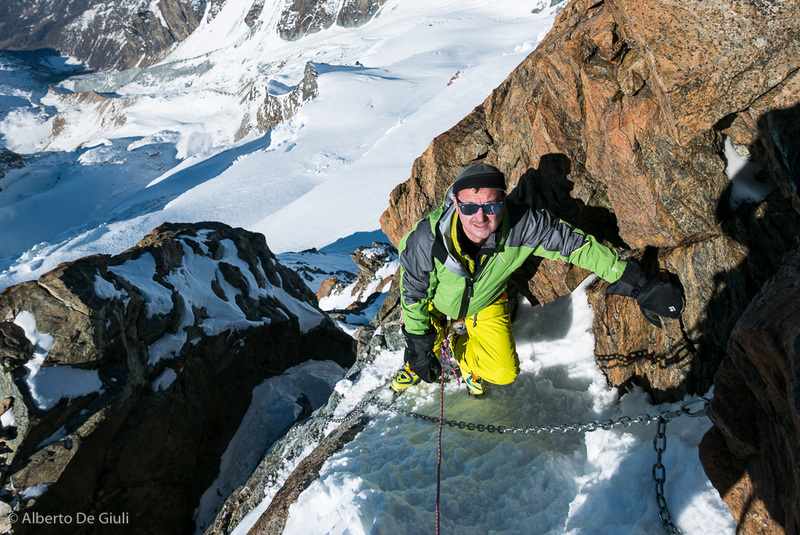 The descent of the Grenz glacier will keep you busy for two good hours, and if you do not want to miss the last lift that takes you to the Klein Matterhorn is better you don’t waste time around! 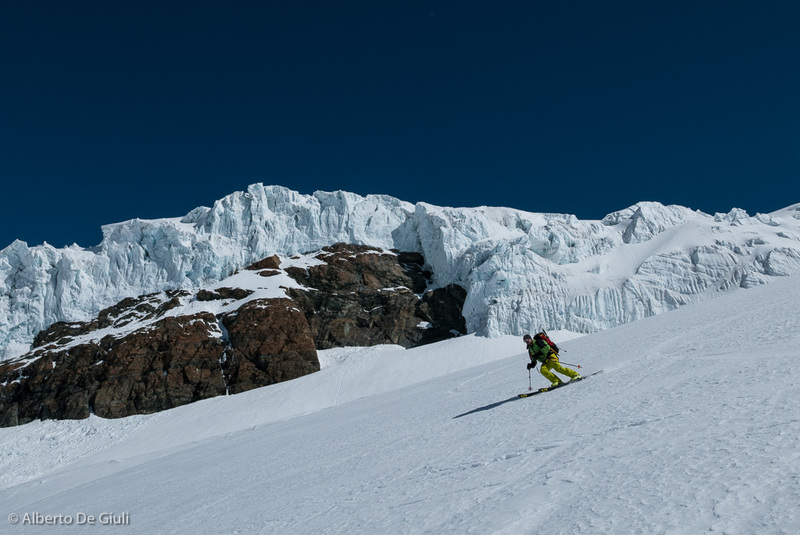 Ski down the Grenz glacier. Ski touring in the Monte Rosa massif. 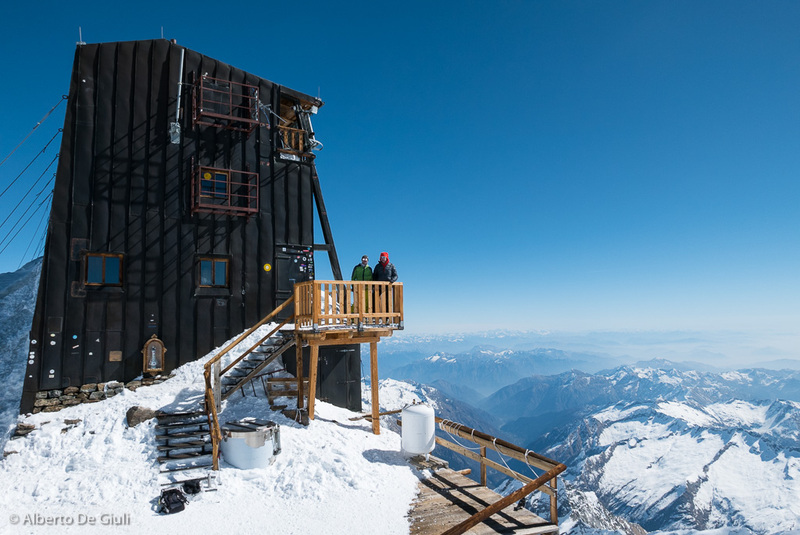 Once you’re on the Klein Matterhorn cable car, mission is accomplished, you just need to get to the hut you booked for the night. 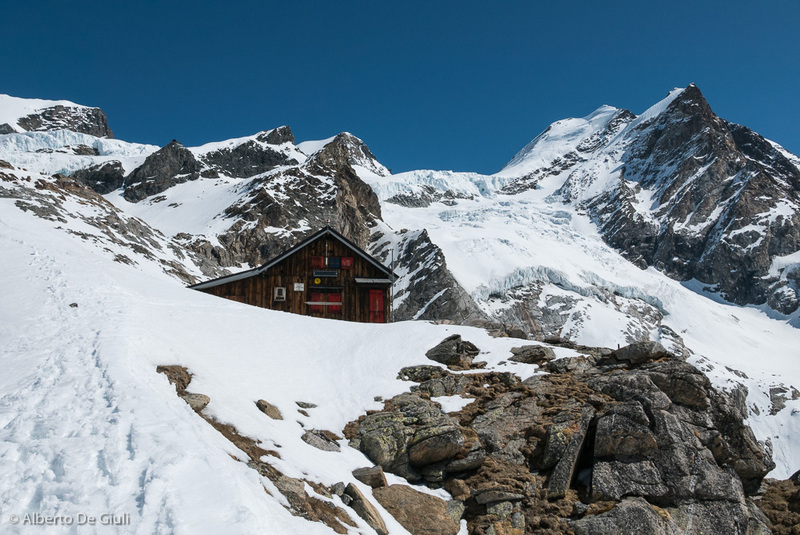 There are two options on the Italian side, Rifugio Teodulo and Rifugio Guide del Cervino. 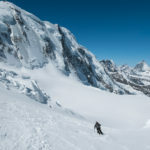 If you don’t like the idea of skinning up the slope of Plateau Rosa early next morning, you can spend the night on the Mountain Lodge at the top of the Klein Matterhorn cable car, the prices are very much Swiss, but after all is very comfortable, they can also make you dinner upon request, and the next day, ski on, you just have to glide down the Breithorn Pass without sweating. 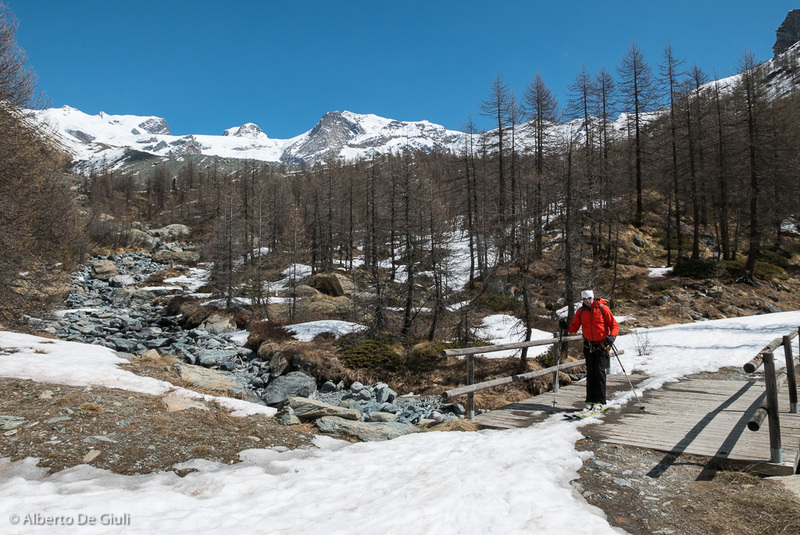 Day 3 is your last journey, and again there are two possibilities to go back to Gressoney. 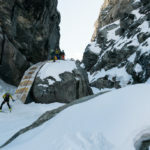 You can traverse the Castor down to Felik Col in order to ski down the Felik and Lys glaciers to Salza, above the Stafal lift station in Gressoney. The second option, which is also my reccomendation, you climb on top of Pollux without skis, it’s an easy and enjoyable climbing, with a steep section equipped with couple of steel chains, and then ski down the Grand Verra Glacier to Piani di Verra. 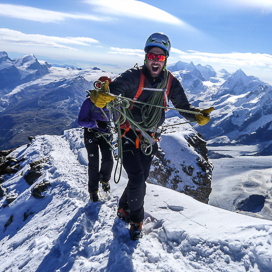 A long and exciting 2000 meter vertical drop descent down to a very wild valley. 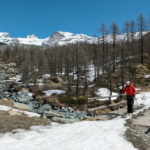 From Piani di Verra, you can reach the lifts in Champoluc, Ayas Valley, either on foot or by jeep transfer ( highly recommended if you don’t want to ruin a perfect day). 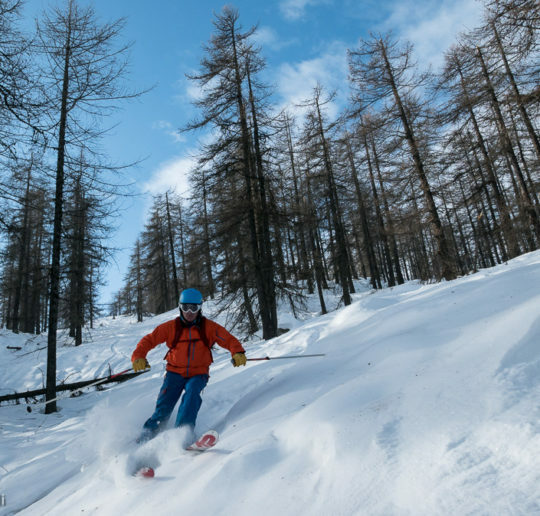 From Champoluc, you just have to jump into the chairlift and enjoy a well deserved lunch at Colle Bettaforca before skiing down to Gressoney. 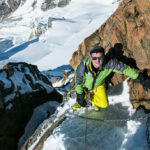 Polluce, sci alpinismo nel gruppo del Monte Rosa. 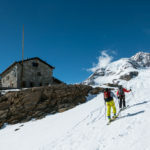 The Monte Rosa cable cars are still open for a few weeks from the Italian side, the huts until May 7 (Sella and Guide Val d’Ayas are open as well, because of the Mezzalama ski marathon race). 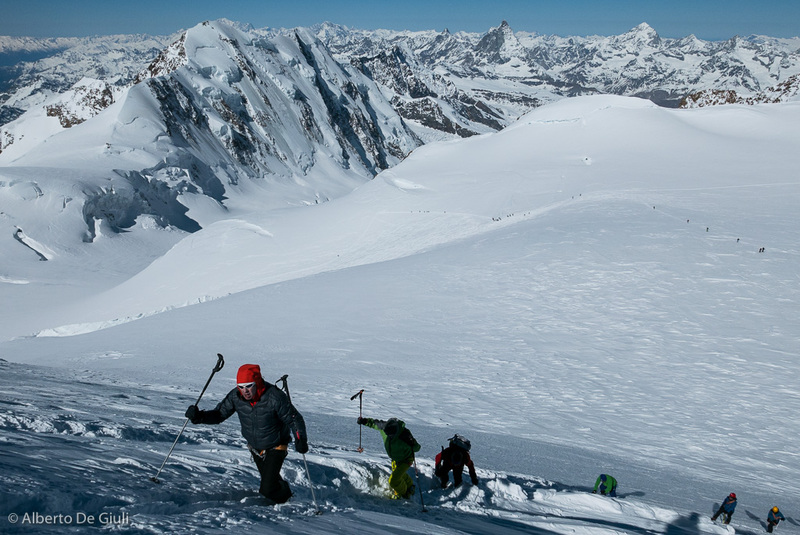 This trip is just an idea, spend some times on maps to design your own adventure if you don’t want to hire a mountain guide…and have fun! 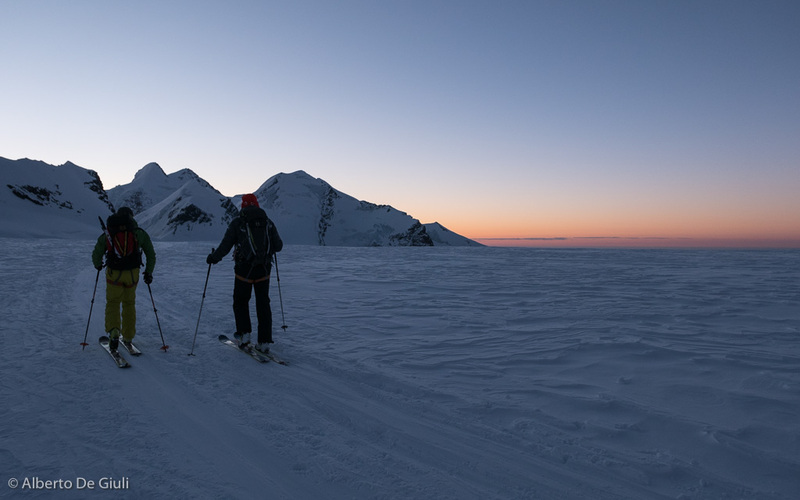 Punta Giordani, ski touring around Monte Rosa massif.Punta Giordani, ski touring around Monte Rosa massif. 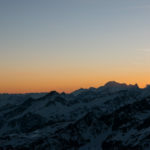 Sunset over Mont Blanc from Rifugio Mantova. 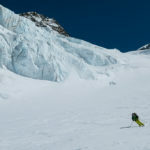 Ski touring around Monte Rosa massif. 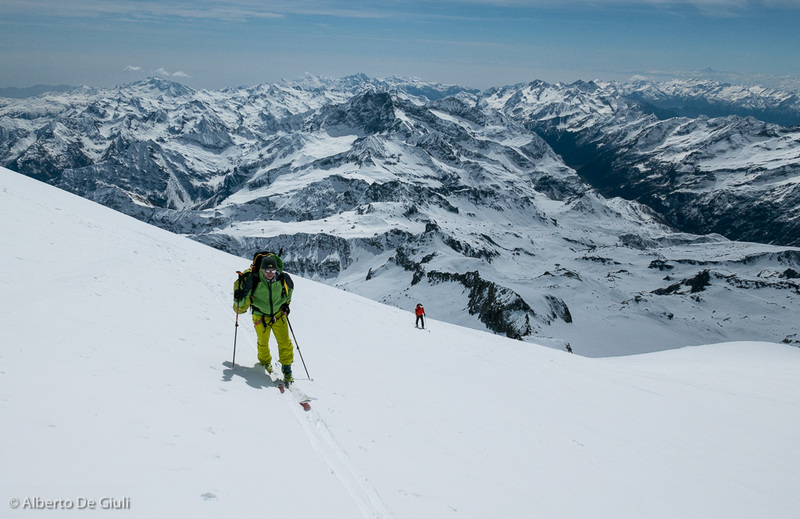 Skinning towards Capanna Margherita, ski touring around Monte Rosa massif. 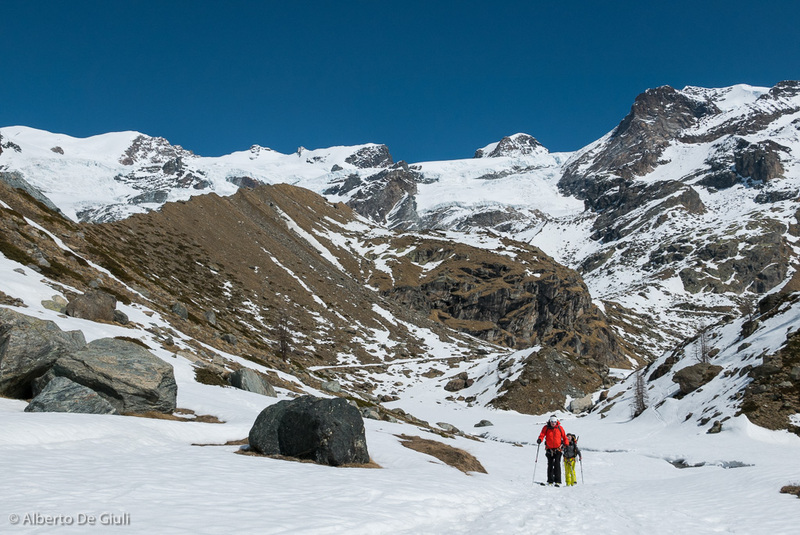 The last steep bootpack to Capanna Margherita, ski touring around Monte Rosa massif. Capanna Margherita, ski touring around Monte Rosa massif. 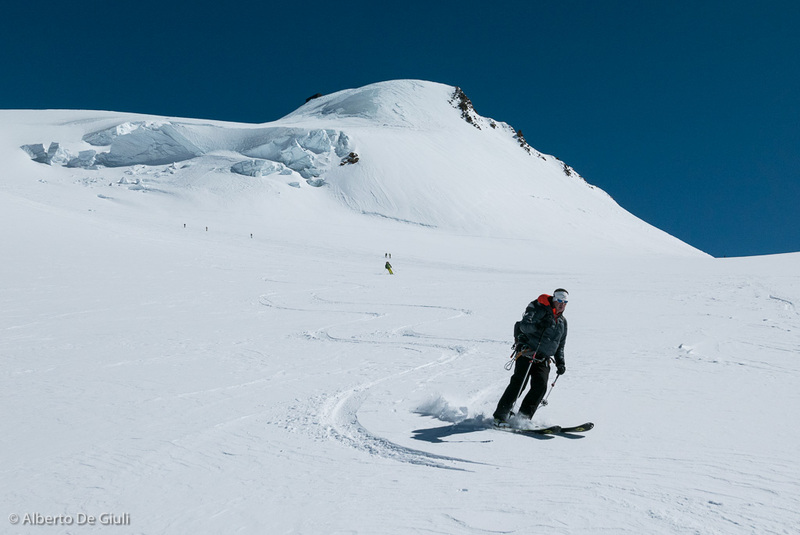 Ski down the Grenz Glacier. 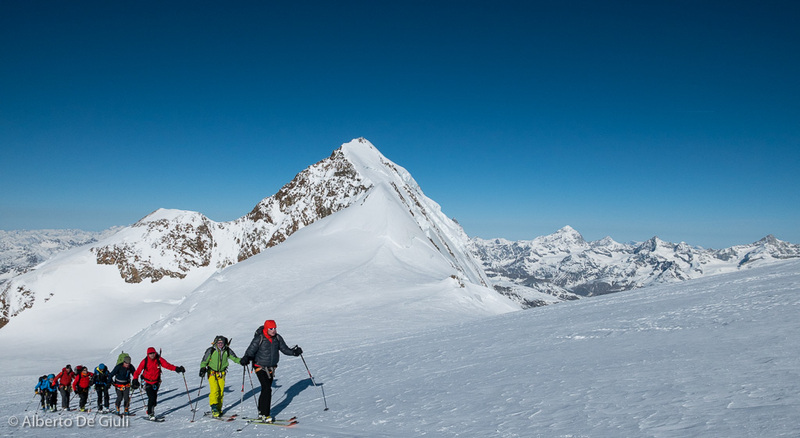 Ski touring around Monte Rosa massif. 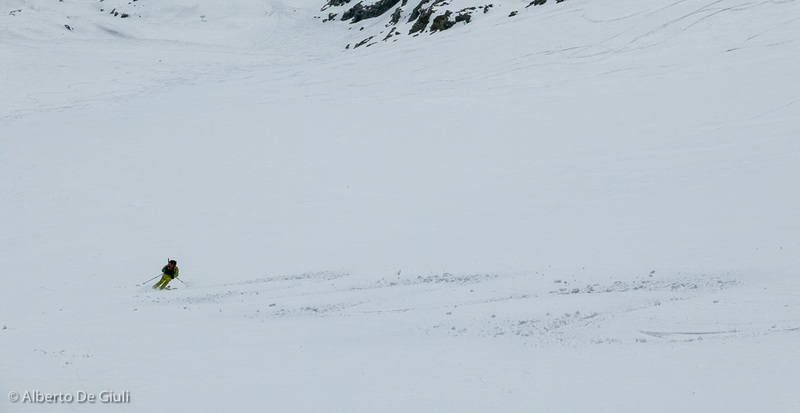 Approaching to the Pollux. 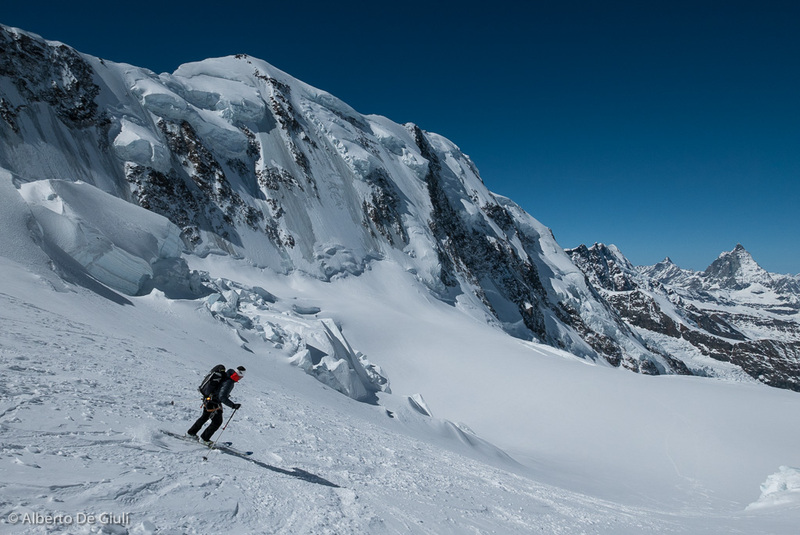 Ski touring around Monte Rosa massif. 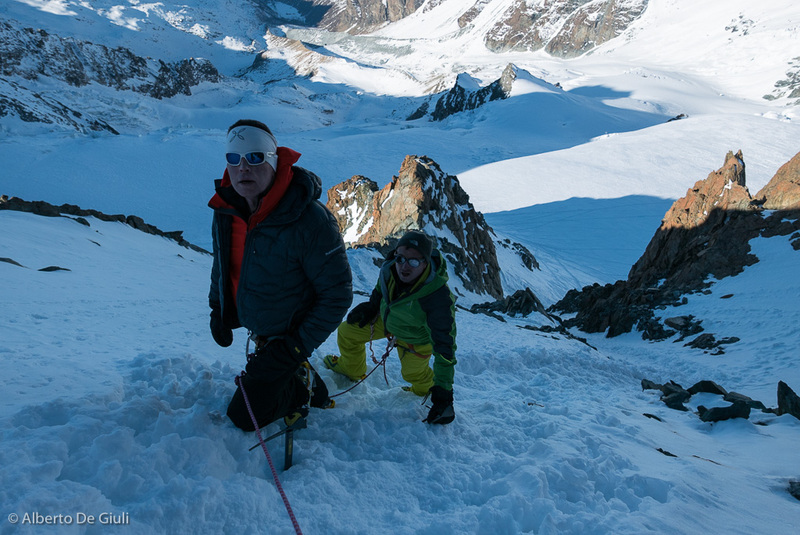 Ready to climb to the top of Pollux. 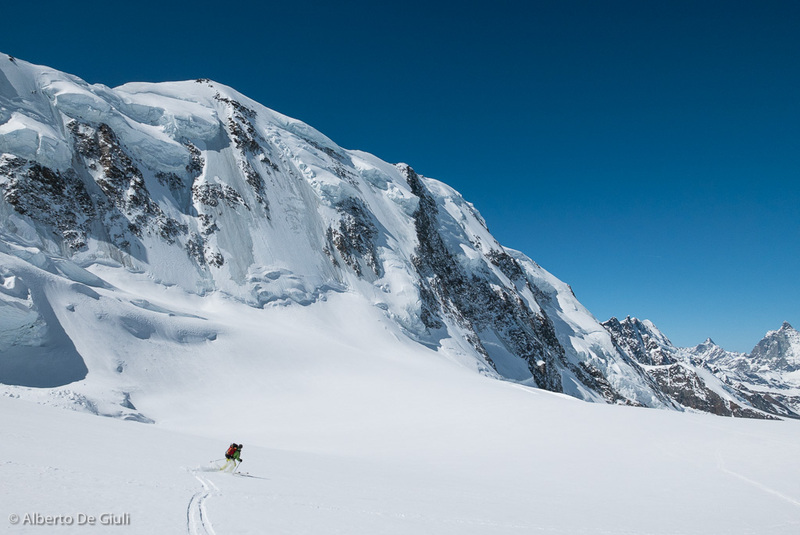 Ski touring around Monte Rosa massif. On the fix steel chains of the Pollux. 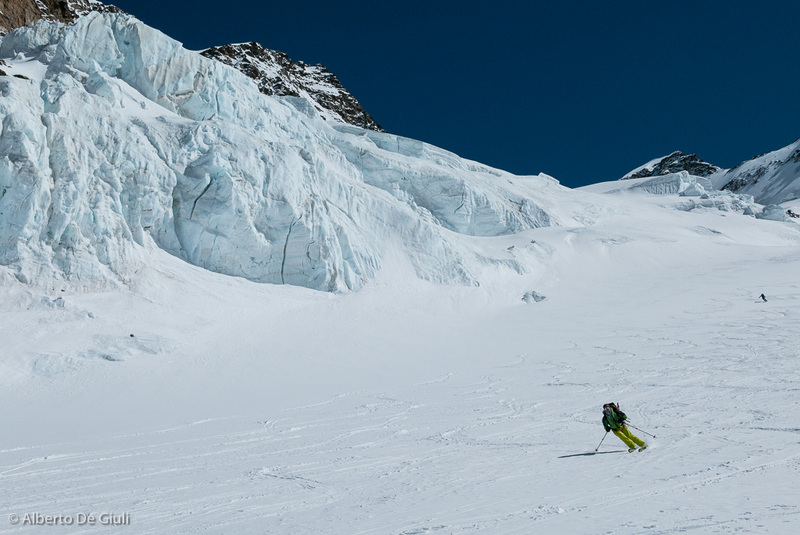 Ski touring around Monte Rosa massif. 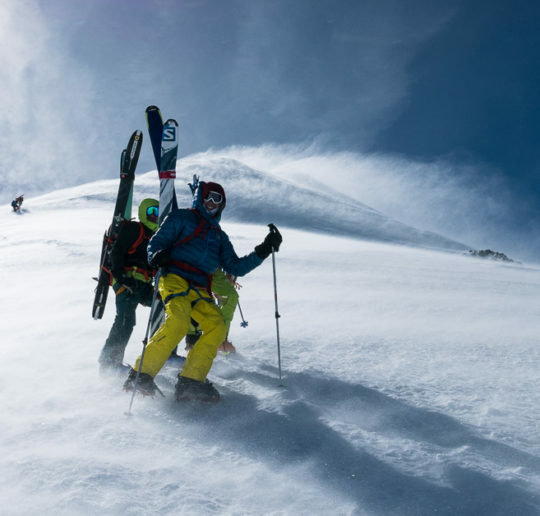 Top of the Pollux. 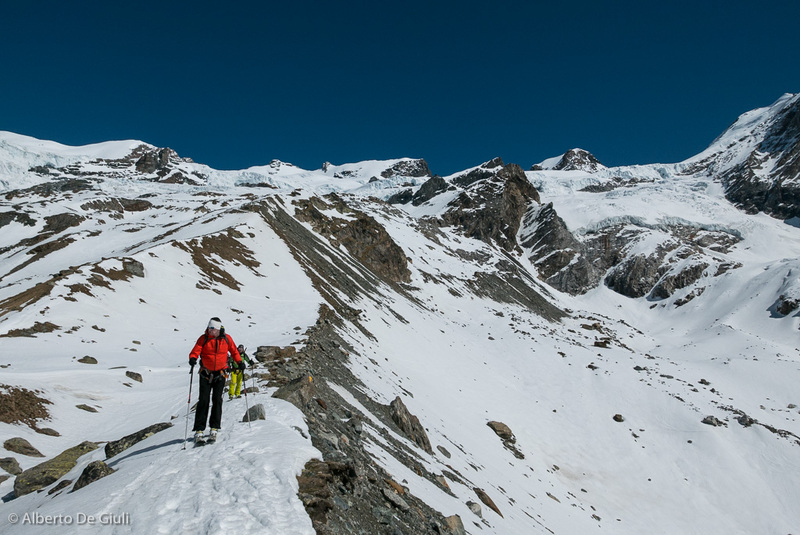 Ski touring around Monte Rosa massif. 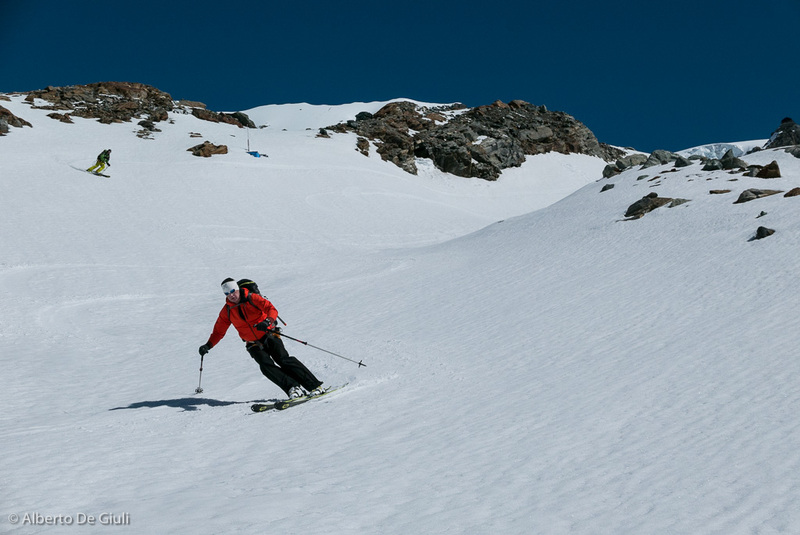 Skiing down the Verra glacier. 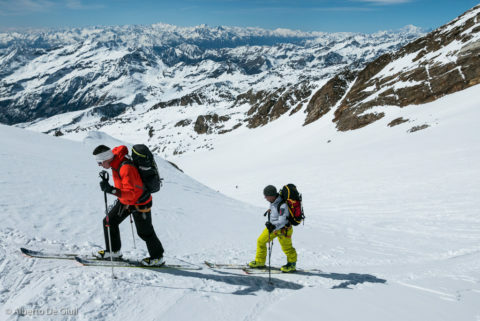 Ski touring around Monte Rosa massif. 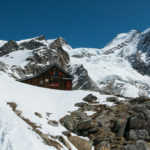 Rifugio Mezzalama. 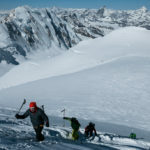 Ski touring around Monte Rosa massif. 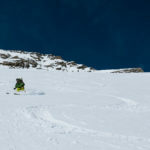 Piani di Verra after skiing the Verra glacier. 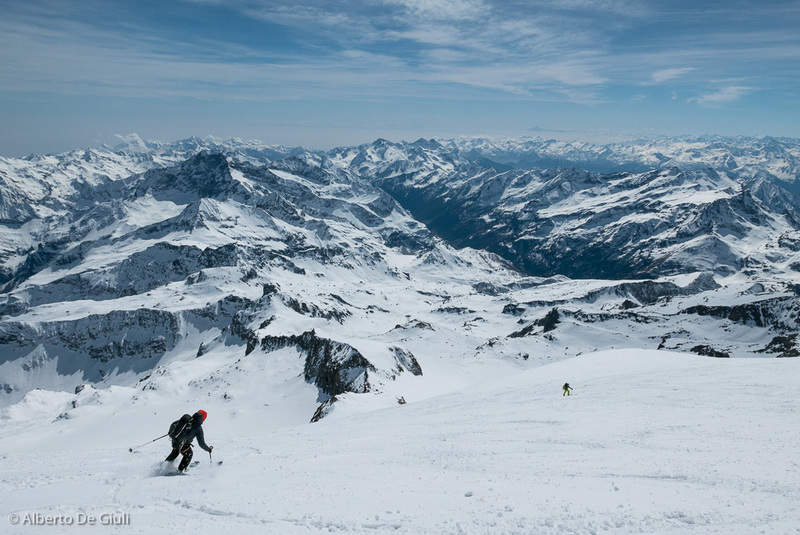 Ski touring around Monte Rosa massif. 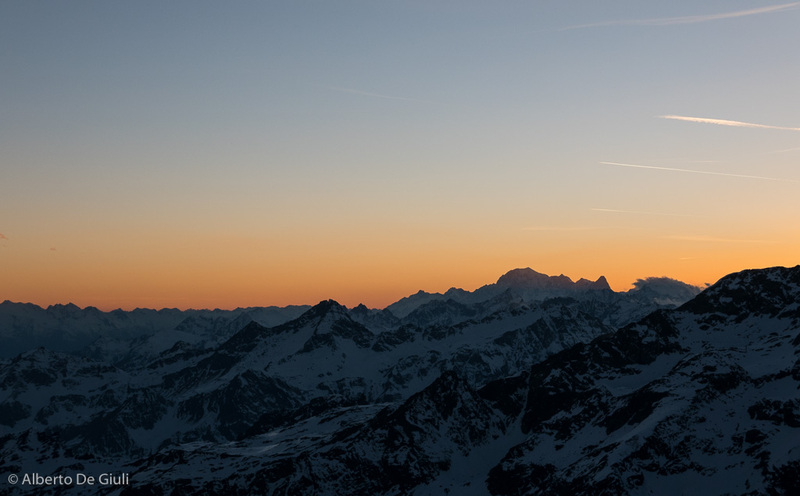 Vipiteno, South Tyrol. 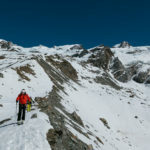 Ski touring in Val Racines and Ridanna. 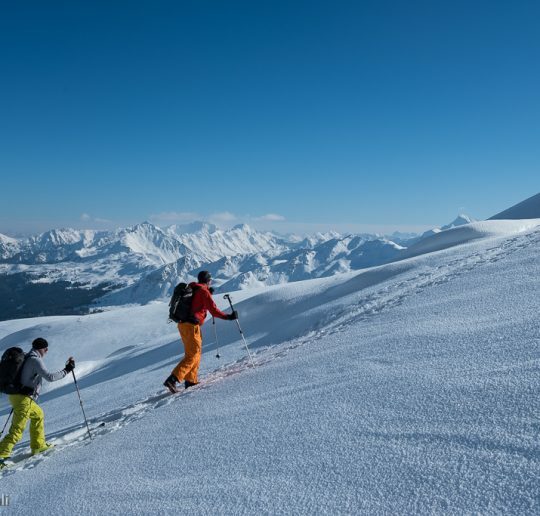 Off-piste skiing and ski touring in Sestriere and Monginevro.